That is North Pole, Alaska, not THE North Pole. However, they do have a pole which they had dropped from an airplane at the magnetic north pole and then recovered by a search party. After catching up on sleep and the internet in my hotel room, I loaded the bike back up in the early afternoon only to find the battery completely dead. It is debated as to if you can push/bump start a fuel injected bike. A young kid outside a hardware store would later tell me that Arctic Cat makes EFI snowmobiles that don’t have a battery, so it’s gotta be possible. Nevertheless, the bike was heavy and I was not on the top of a big hill to try. I asked a contractor working nearby to give me a jump, and he sent one of his workers over with a pickup truck. He was impatient though, and the bike wouldn’t immediately start once I got the cover off and the cables on, so he took off. I debated calling BMW Roadside Assistance, but was reluctant because I knew I would have to work at finding someone helpful. I called up Dan at Adventure Cycleworks and talked it over with him. He was very helpful and gave me the number for the local Harley dealer that also sold BMWs, as well as the part number for the battery and some other contacts. The dealership would have a battery the next day, but of course I had to get the bike there myself if the service department was going to be any help. I checked back into the Hotel North Pole, getting my old room back at a discount because they hadn’t cleaned it yet. They mentioned that they had a jump-starter and I took them up on it. I expected it to be one of those battery packs that you can plug into your cigarette lighter outlet, or maybe the same with clamps, but in fact they had a really nice standup battery charger with a built it jump-start setting. Because it gets so cold in Alaska, there are outlets in the parking lot for hooking up engine block and battery heaters when parked overnight, convenient for running the battery charger as well. The bike has a small sealed battery, so I put the charger on low and let it sit. This time, I noticed that the fog light came on as soon as I hooked up the charger. The fog light has a toggle switch, as well as a relay that so it won’t come on unless the headlight is on as well, so this was odd. I had already replaced the relay once because it wasn’t closing, but now it was stuck open. Rather than muck with it, I pulled the fuse for the fog light. Then I walked over to the NAPA auto parts store for a battery tender. Because it was down the highway, I got walking directions from Google and wandered threw a maze of residential streets. 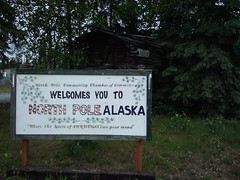 North Pole started growing on me, as the developments were just dirt roads with nice small homes and cabins. I happened past the visitor center along the way, and stopped in on my return trip. They were incredibly friendly there and I got the map tour of town as well as the opportunity to send a post card and have the stamp cancelled from North Pole. One of them had to make a trip into town and even gave me a ride back to my hotel. I came back and the bike started fine, so I switched to the battery tenderer, which had a lower charging rate which is easier on the engine and so that I could return the nice [expensive] charger to the hotel. I wandered around a bit for a meal, and found a local department store where I picked up an AC charger for my phone and some Brenneke Black Magic shells for the shotgun. Convenient town, this North Pole is. I decided I would trust the battery and not go back into Fairbanks in the morning for a replacement at the dealership. The day off hadn’t been too bad as I got the opportunity to rest and talk to some people close to me. Tomorrow I would head back on the road. I hadn’t been sure of what the middle of my trip was going to be when I left Seattle, but I determined that I would first try to get some flight training in Alaska, and if I couldn’t satisfy that I would ride down the coast for a couple of days. Either way, I was headed toward Denali National Park. This entry was posted in Uncategorized on June 23, 2011 by btm.